Here you will find information about workshops held in the UK run either by Wee Kee Jin, or by his UK instructors. For a full list of Wee Kee Jin's International workshop schedule, please visit his website. A brief listing of UK workshops for Tàijíquán or Baihequán is below. Use the main navigation bar to view further details. 20th-22nd October 2017 - Taiji with Wee Kee jin in Sheffield. 8th - 16 April 2017 Taiji Camp in Hethersett with Wee Kee Jin. 22nd - 23rd April 2017 - White Crane workshop with Wee Kee Jin, in Norwich. White Crane workshop with Paul Fretter in Norwich 6th-7th December 2014. Tàijíquán 21st Sep 2014 - Push Hands workshop with David Gillon and Bill Rowles in Harpenden 21st Sep 2014. Tàijíquán 12th-20th April 2014 - 8 day Taiji camp with Wee Kee Jin in Hethersett, Norwich. Baihequán 9th-10th November 2013 - a White Crane weekend workshop will be run in Norwich by Wee Kee Jin. Tàijíquán 1st-3rd November 2013 - a three day workshop in Sheffield with Wee Kee Jin. Tàijí Sword 14th September - a one day workshop in Norwich with Paul Fretter. Tàijíquán 17th-18th August - a two day workshop in Edinburgh with Peter Dobson (Dharmamudra). Tàijíquán 28th July 2013 - a one day workshop in Cambridge with Prasanavira (John Linney). 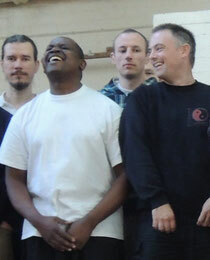 Tàijíquán 23rd-31st March 2013 - 8 day Taiji camp with Wee Kee Jin in Hethersett, Norwich.